« A blog is born! You know this popular little book, right? I thought of it last night when my 15 month-old woke up at 3:45 am and decided to stay awake for the next 2 and half hours. Thank goodness I am off work today and could sleep in a little to make up for the lost time. By the time he drifted off to sleep at 6:15, I was too wired to just go to sleep myself. So, I had to employ some of the sleeping techniques I’m about to share with you. You don’t have to have a 15 month-old to have trouble sleeping. Nights are hard. After the lighs are off, it’s just you and your thoughts. I once heard a sleep doctor say that he thinks people stay up watching TV, etc, until they are absolutely exhausted because we have a hard time facing the time alone with ourselves in bed. We just want to collapse asleep and skip the alone time. There may be something to that. For many of the people I see in hospice work, nights are often the time when they have the most pain and restlessness. Our spiritual care director once told us (chaplains) that a good indicator of someone’s spiritual pain is to identify what it is that keeps them awake in bed at night. I learned some time ago that the best way to go to sleep at night is to turn off my thoughts. Once we get into bed, the tendency is to go into “movie mode” — replaying the events of the day or thinking about what will unfold tomorrow. There is probably some benefit in the reflection time (especially if you’ve not had any alone time during the day), but not for too long. So when it’s time to sleep, I do two things: employ my senses, and use visualization. To employ my senses means simply to focus on what I am feeling rather than thinking. Thoughts may still come, but I let them go by and focus instead on the warmth of the bed, the softness of the pillow, the sounds in the room, etc. One of the simplest ways to do that is to focus on your breath, feeling and hearing the air coming in and out. You can do this as a form of meditation during the day while sitting up (it’s a good way to rest the mind). When I do it lying down with eyes closed, it very often puts me to sleep. If I need some extra help, I enlist my visualization techniques. First, I envision myself going down a spiral staircase, to symbolize going deeper into my relaxing place. Then, I imagine myself there. For me, it is very often the beach or the woods, always with some water element (a waterfall, or a hot spring). Again, I employ my senses, but this time with my imagination. I feel the wet sand between my toes, hear the sound of the crashing waves, feel the warmth of the air… you get the picture. If a problem or decision to be made is keeping you awake, use your imagination to let your subconscious work it out for you. I often envision sitting underneath a “wisdom tree”, or next to God. Or, I may ask God to speak to me in a dream. You can also envision a “worry tree” where you hang your worries for the night. Once I get into my relaxing place and let my worries rest, it is not very long until I’m in lala land. So try these; it takes some practice, but you will get the hang of it. And if you still can’t fall asleep, tell yourself it is OK to lie there and REST. Just enjoy being in your relaxing place for some good alone time. I LOVE balsamic vinegar. I use it for bread dipping and sometimes add it to sauces. Sometimes I marinate fruit in it and it makes a great dessert! 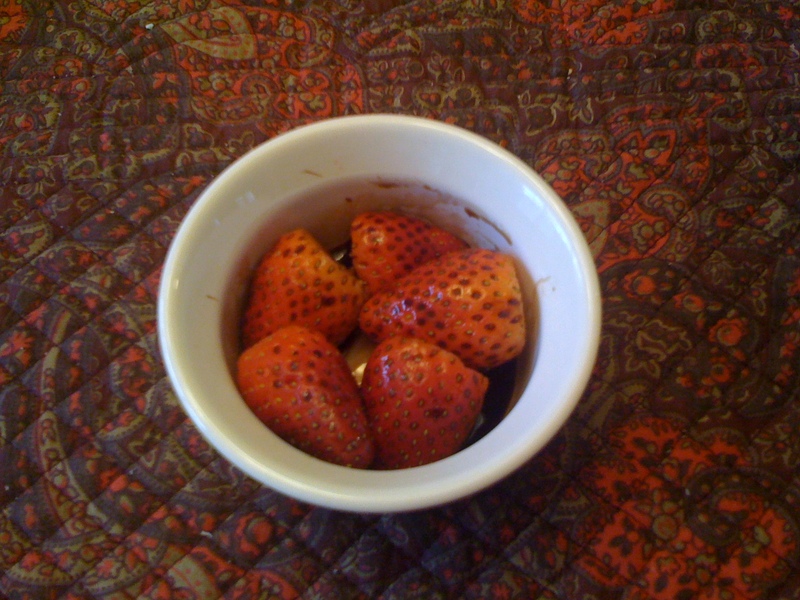 This time I marinated the strawberries in dark chocolate balsamic (yummy). Fast, healthy and delicious! You can find flavored balsamic vinegar in specialty stores, but plain balsamic vinegar tastes good with strawberries or oranges, too. Add a little extra virgin olive oil and some fruit jam, and you’ve got a great vinaigrette, perfect for fruity salads! These are great suggestions Alice! I also will count my breaths in and out when I can’t sleep to give myself something to think about – guess it’s like the old counting sheep method. Congratulations on the blog – I’ll look forward to what you have to say!